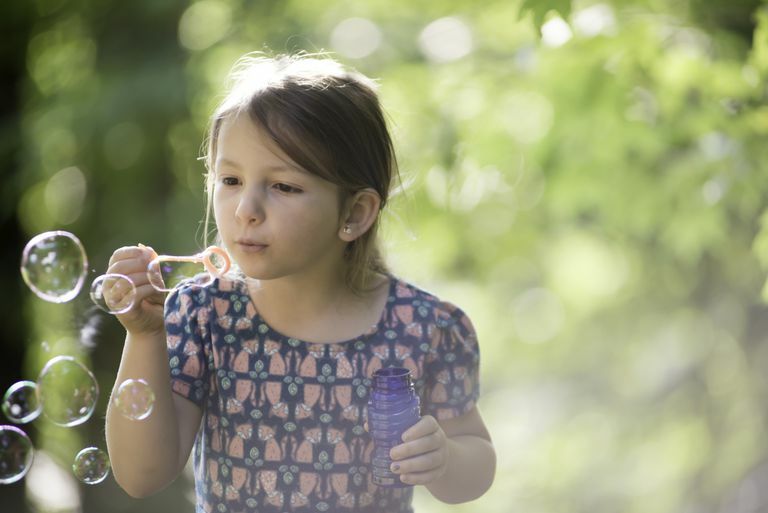 Blowing and chasing bubbles with your kids will get you outdoors and enjoying healthy exercise. It's a fun activity for all ages. You don't have to spend money on store-bought bubbles. Making a bubble solution at home will not only save money, but it also introduces kids to how to use the kitchen, measure ingredients, and perform a little easy math. Making homemade bubbles also teaches lessons about reusing and repurposing materials, sparking your child's imagination. There is science to the process of making good bubble solution. Water by itself has a high surface tension and plain water bubbles are small and quick to burst. Adding soap or detergent to the solution lowers the surface tension and allows larger bubbles to form. Glycerin and corn syrup help the bubbles last longer by slowing down evaporation that causes them to burst. When making homemade bubbles, it is best to do it in large batches. Use either a clean bucket or a washed-out gallon-sized milk container. Then store the leftover bubbles in the milk container or a large plastic pitcher. To use the bubble solution, pour it into an empty store-bought bubble container or a cleaned out, cylindrical-shaped frozen juice containers. This simple recipe produces good bubbles. Many people use just water and dishwashing liquid, but the addition of corn syrup, like Karo syrup, or glycerin holds the solution together to make better bubbles. Stir together until everything is dissolved. Regular bubbles have a nice sheen of their own, but adding a few drops of liquid food coloring to the mixture really makes a big difference. Make sure you make this outside, away from anything that you don't want stained (cars, patios, decks, etc.). The food coloring usually washes away, but you don't want to take any chances. Dissolve soap in warm water. Mix in the food coloring until you get the shade you want. Use this as an opportunity to discuss how colors combine with your child. For example, yellow and blue make green, and blue and red make purple. Adding sugar also seems to produce bubbles that are bigger and slower to pop. If you are having a bubble-blowing contest, that could be your secret advantage. Mix all ingredients together until sugar dissolves. If you happen to have bubble wands from store-bought bubbles lying around the house, you can use those. But experimenting with different household items can also be a lot of fun. You can find things that you are either getting rid of or serve a different purpose but are a good fit for making bubbles. Enjoy bubble blowing and encourage your kids to get lots of healthy movement and play.